"The demands on machines and packaging will continue to rise"
"In the past we used to ask what should be packaged - apples, cherries, plums - but that's not enough nowadays. Now you have to know, for example, which foil material to use, testing and calibrating the machine accordingly, so that you can start from scratch and do a good job for the customer," said Dr. Markus Nöthen from packaging machinery manufacturer Redpack GmbH, about the current situation within the industry. "All machines operate with conventional and cutting-edge plastic film, but also with bioplastics from cellulose or parchment, and some operate with mixed varieties." There is currently much more discussion about whether a packaging material is good or bad. With our machines, we are flexible - as long as the material comes on a roll, we can first test it in the factory and use it in practice." Another important question is what printers and labellers will be used. "Here, there are much more options, but are always looking for the best operating solution." At Fruit Logistica, three machines are presented in more detail this year. In the field of herbs, the horizontal Redpack NTS bagging machine for packaging fresh cut herbs will be demonstrated. A distinctive feature of this machines is that it can also handle very small packaging sizes. "One advantage of our machines is that you do not need a punnet for the apples anymore. Normally you would like to see this fruit in cardboard trays with a shrink wrap, but with our machines you do not need a tray anymore, saving packaging material and the environment." The P325E-FI machine is already in use for the tray-less packaging of apples in a Flow Pack. 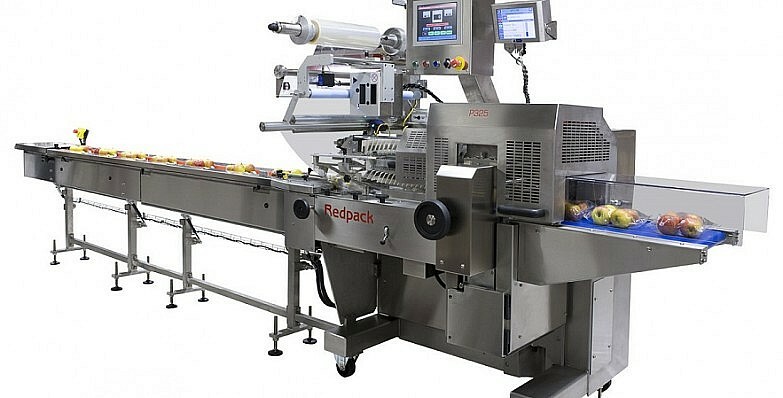 "This tubular bag line for tray-less apple packaging has an exemplary new, frictionless feed," said the expert, who also stated that the Redpack technology is so gentle that the apples do not get bruised. Finally, Redpack presents the NTS BMI tubular bag machine. As a result of intensive cooperation with leading producers, this practical solution for the packing of iceberg lettuce. "Our machine is gentler on the lettuce, faster, requires less manpower depending on the harvesting process, and packs the vegetables into a closed flow pack, which protects it better from germs and contamination after harvesting - a solution that is being tested in the market." The English engineering company from Norwich, north of London, services not only Germany but Austria, Switzerland and South Tyrol as well, via its sales office in Cologne. The machines are individually planned and manufactured and are suitable for packaging fruits and vegetables in bags and shrink packs, among other things. Visit Redpack Maschinen GmbH at this year's Fruit Logistica, from 06.-08. February, in Berlin: Hall 9, Stand F-03.